​the year when leaves fly through the air like giant colored snowflakes. As I surveyed the town’s quaint shops, my eyes met ghoulishly drawn window paintings and I quickly glanced away, remembering the season. I didn’t want my morning tainted with images of blood, vampires and witches. Oh, I know that someone probably had a blast drawing the pictures, but to me, well, something about them and the holiday altogether just doesn’t sit right with me anymore. When I was younger, I used to count the days till Halloween. Every year, my brother and I would get out our old clothes and stuff them with newspapers. We’d draw a “scary” face on a brown paper bag for the head, and put our big “dummies” out on the front stoop – setting the scene to frighten trick-or-treaters that came to our door. And I remember in college, I helped host a Halloween party in our dorm’s suite. We dressed up like zombies and even had an old coffin where we’d reach out and try to grab passersby. I had developed a strange skin rash and the diagnosis? “Candy-itis.” Yep, I ate way too much of my “loot” on that holiday night. Ahh … whether it was traipsing through haunted houses, cutting scary faces in jack-o- lanterns, or dressing up as a hobo, a witch or a cheerleader … I loved it all. But there came a time in my life when I began to question my love for the holiday. It was a friend who was strong in her walk with Christ that called me out on it. “You mean you celebrate Halloween?” she surprised me one day with the question. I was a bit shocked by this, I mean, who didn’t right? I remember once walking through the lobby of the Christian Broadcasting Network ministry in Virginia Beach, Va., when something on their brochure rack caught my eye. It was a leaflet on Halloween entitled: “Hallowed or Harmful? 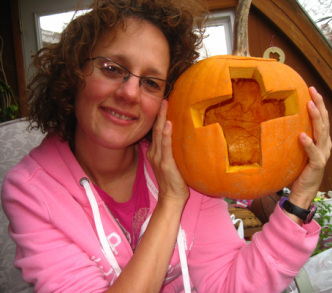 Christian Perspective On Halloween.” And reading it gave me a fresh perspective on the holiday. Finding out the history of Halloween was quite a shocker really; my eyes were suddenly opened to the holiday’s sordid past. Halloween started out at a pagan festival among the Celts who inhabited Britain and Ireland hundreds of years ago. that separated the living from the dead was at its thinnest. The booklet goes on to state that the Celts believed that although these spirits could torment people, they could also be used to divine or tell the future. And, in order to avoid a “trick” from the spirits, it’s believed that they tried to appease them by leaving a food or a “treat” out for them. Later, people would dress up as evil spirits and go house to house demanding a treat in place of an evil trick. And, as the practice of witchcraft grew in the Middle Ages, its symbols of witches, black cats, and skulls were added to the festivities Halloween. The holiday is also a big one for those who practice witchcraft today. Oh I know, you probably don’t celebrate it like that so what’s the big deal right? Your kids are dressed up like princesses and superheroes – what’s so bad about that? I know dress up is fun, believe me, my five kids have had their share – at all times of the year. But I don’t know, I don’t think Halloween is fun anymore. The more I grow in Christ, the more I realize the reality of demonic influence in our lives. And the more I try to stay away from any of it. If you’re a parent or a grandparent, I know that celebrating Halloween can be a tough call when it comes to raising kids. Believe me, I face the challenge every year. Keeping my kids away from the influences of the season can be a difficult. Society kind of demands it doesn’t it? But for me, well, shielding our family from something that has such an evil heritage far outweighs the cost of a few sneers. For more Halloween insight check out: "Should Christians Celebrate Halloween," by Elliott Watson. "I will resolutely reject persons who dabble in the occult or traffic with mediums, prostituting themselves in their practices. I will cut them off from their people.